The day of Elizabeth’s accession changed Amy Dudley’s life, whether she knew it or not. On 17 November 1558 she was most probably staying at Throcking, Hertfordshire, at the house of Mr. Hyde, where she (and possibly her husband) had mostly lived for well over a year. Elizabeth’s takeover of the realm changed Lord Robert’s life even more than Amy’s, in so far as he once again got a post at court after five years of disgrace; and what a post – the Master of the Horse was one of the most important household servants with very close personal contact to the monarch. The court was his natural element and, quite apart from this, his family, not least his country-loving elder brother, expected him to make a career there for the benefit of them all. 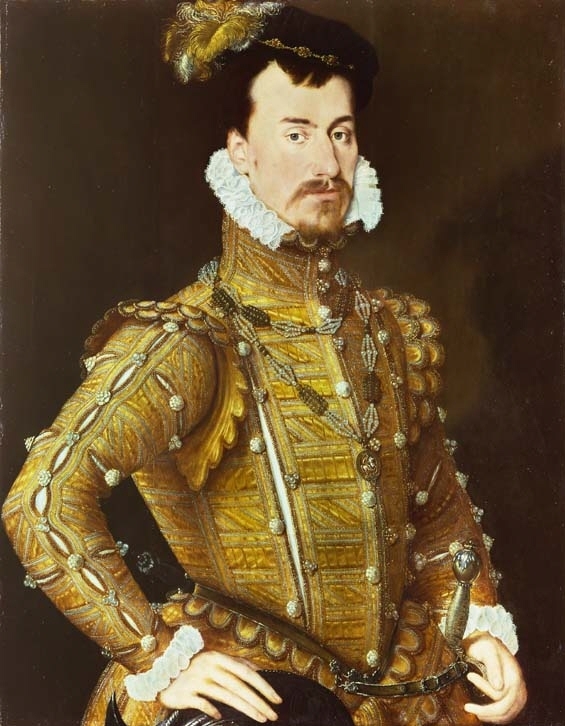 Robert Dudley, in 1559 or 1560, proudly displaying his new Garter chain made of pearls. As Robert Dudley took up preparations for important events in the new reign, such as the coronation, his wife decided to visit relatives up in Lincolnshire, whence she returned to Mr. Hyde’s house sometime before Christmas. It was not before Easter that she saw her husband again, for a few days, when he visited her at Throcking during a parliamentary recess: He passed away the time playing cards or dice with Mr. Hyde! In May and June Amy stayed in London for about a month, a visit that ended with Robert moving to Greenwich with the court. At this point she seems to have made a visit to Suffolk, it is unknown why. In London she had not stayed at court, but in her mother’s family home, Camberwell, and in a residence used by Robert Dudley, Christchurch. We do not know whether she stayed at her husband’s house at Kew, a stately property given to Robert by the queen only weeks after her accession. By September Amy Dudley was to be found in Warwickshire, in Compton Verney, at Sir Richard Verney’s house, and by December 1559 she had moved to Cumnor in what was then Berkshire, to live in the large house rented by Sir Anthony Forster. Like Hyde and Verney, Forster was an old member of the Dudley affinity; he had faithfully assisted Robert financially in difficult circumstances and now acted as his de facto treasurer; he may also have been his wife’s relative. During 1559 three different diplomats reported that Amy Dudley was suffering from serious health problems, possibly entailing some kind of eating disorder, however caused, which would explain her fear of poison – imagined poisonings, as opposed to real ones, being extremely common at the time. The last of those reports, from June 1559, said that her health had improved somewhat but that she was still very careful of what she ate. Although not a few other sources also imply that she suffered from some illness – and the fact that she no longer travelled in 1560 may add to this impression – the principal reason why Amy did not reside anywhere near the court seems to have been less her health than the queen’s jealousy. When Amy died in September 1560 she had not seen her husband for 15 months. He had planned to visit her in July during the royal summer progress, but sadly, the progress of 1560 had to be cancelled for political reasons. Robert Dudley tried to make it good with presents. He also allowed Amy, and this was generous behaviour at the time, to independently use the proceeds from her parents’ inheritance for her own little household. She maintained some 10 servants and lived in some style, which was only appropriate for the wife of one of the country’s most prominent figures. Thomas Blount, his own steward, was another man Robert Dudley entrusted with errands to his wife; he was also the man who heard of Amy Dudley’s unexpected death when on his way to her in September 1560. We hear of “Mr. Blunt’s horse-hire when he rode to my lady in the Christmas” of 1559, but also of “blue sewing silk sent to my lady by Mr. Forster”, together with a looking glass.6 In June 1560 Robert sent “a velvet hat embroidered with gold for my lady”, worth £3, and a supply of 10 pairs of velvet shoes7 (this particular kind of footwear needing frequent replacement). Calendar of … State Papers Relating to English Affairs … in … Simancas, 1558–1603. Volume I. (ed. by Martin Hume, 1892–1899). HMSO. Adams, Simon (2011): ‟Dudley, Amy, Lady Dudley (1532–1560)“. Oxford Dictionary of National Biography. Online edition. Jackson, J. E. (1878): “Amye Robsart”. The Wiltshire Archaeological and Natural History Magazine. Volume XVII. This entry was posted in Amy Robsart, Elizabeth I, family & marriage, Robert Dudley and tagged Anthony Forster, clothes, health, jewels, Thomas Blount. Bookmark the permalink. Great article, but I am not sure that Elizabeth’s jealousy would be a big reason for Amy living apart from her husband. After all, Mildred Cecil didn’t live at court with her husband, either … yet I don’t think anyone believes that Elizabeth was in love with William Cecil. Love to read all your post, so interesting!!!!! I do not believe that Elizabeth was in love with William Cecil either.